We specialize in creating *custom hand blown glass items. This is a unique opportunity to participate in the creative process, and help design a personalized gift (you choose the color/s and inscription). The custom design is not painted on. It's actually melted into the surface of the glass! These custom pieces make a wonderful gift for someone special. We can ship your gift order wherever you want. Alternate shipping address? No problem here. Our shopping cart / checkout generates a printable invoice for your order, so you'll have a copy for your records. 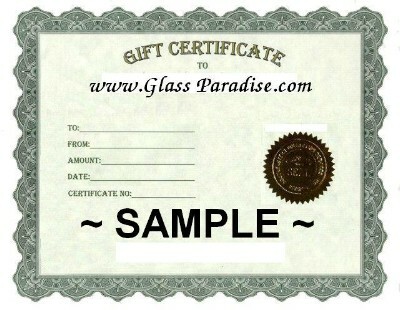 We will send the gift / package to the "ship to" address you provide. Use the "special instructions" field when you checkout to let us know it's a gift (that way we won't include a packing slip w/ the package). Our amazing selection of dichroic BoroImages can really add some razzle~dazzle to the *custom glass pieces in our store. The additional cost will usually run approx. $10.00 (A size image) -$15.00 (B size image) for each image applied. This is another great way to personalize your custom piece or sure to make a cherished gift for that special someone. Picture on the left features a pendant made with Geo 45. Still photos can't do justice because you miss the color shift from emerald green to electric blue. Click Here to see the complete selection of dichroic images we can add to your custom piece.